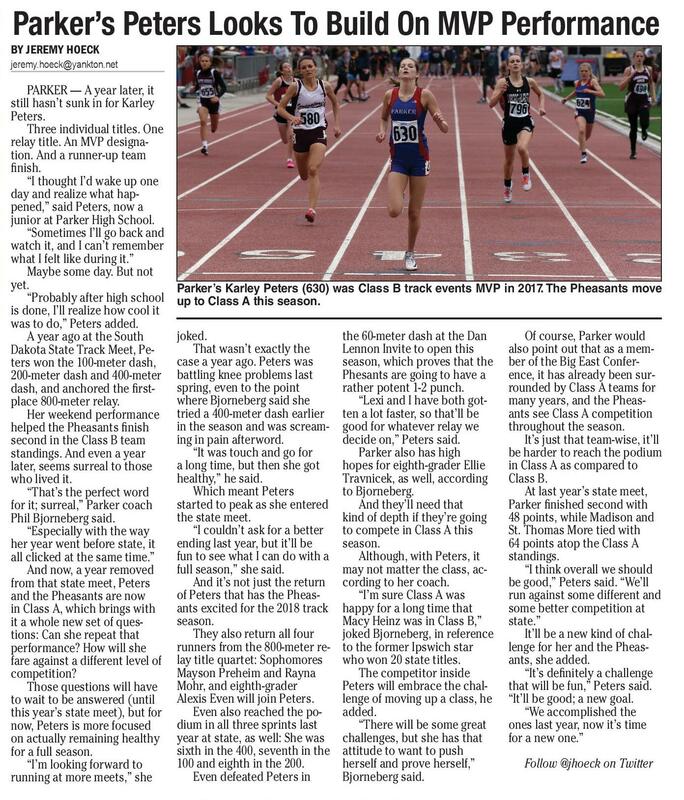 PAGE 10: SPRING SPORTS 2018 PRESS & DAKOTAN n PLAIN TALK Parker’s Peters Looks To Build On MVP Performance BY JEREMY HOECK jeremy.hoeck@yankton.net PARKER — A year later, it still hasn’t sunk in for Karley Peters. Three individual titles. One relay title. An MVP designation. And a runner-up team finish. “I thought I’d wake up one day and realize what happened,” said Peters, now a junior at Parker High School. “Sometimes I’ll go back and watch it, and I can’t remember what I felt like during it.” Maybe some day. But not yet. “Probably after high school is done, I’ll realize how cool it was to do,” Peters added. A year ago at the South Dakota State Track Meet, Peters won the 100-meter dash, Irene-Wakonda’s Shannon Sokolowski was second in 200-meter dash and 400-meter Class B in the 100-meter hurdles a season ago. Her older dash, and anchored the firstsister Lauren was a four-time champion in that event. place 800-meter relay. Her weekend performance helped the Pheasants finish second in the Class B team standings. And even a year later, seems surreal to those who lived it. “That’s the perfect word BY JEREMY HOECK out of the way, I got the jitfor it; surreal,” Parker coach ters out of the way,” Shannon Phil Bjorneberg said. jeremy.hoeck@yankton.net “Especially with the way said. her year went before state, it At the state meet, ShanIRENE — Lauren Soall clicked at the same time.” kolowski once won four con- non then reached the finals And now, a year removed and eventually finished secutive state hurdles titles. from that state meet, Peters second in a time of 15.92 — Her younger sister Shanand the Pheasants are now non came close last year. She behind New Underwood’s in Class A, which brings with Brianna Philipsen. finished second at the state it a whole new set of ques“Going in, we thought track meet. tions: Can she repeat that “That’s some pressure on she’d maybe make it to the finals or perform well, but we performance? How will she me,” joked Shannon, now a didn’t expect a second-place fare against a different level of junior at Irene-Wakonda. competition? She doesn’t mind, though. finish,” Mutchelknaus said. Those questions will have And neither did Shannon. No, in fact, older sister to wait to be answered (until “I didn’t have a lot of time is the reason younger sister this year’s state meet), but for even gave the hurdles a try in to prepare or really get gonow, Peters is more focused the first place — it was some- ing,” she said. “I felt rushed. on actually remaining healthy I was fortunate to do as well thing along the lines of, ‘You for a full season. as I did, given the amount of should give these a try.’ “I’m looking forward to “It’s fun to have my sister time I had to get ready.” running at more meets,” she As nearly a full year has with me,” Shannon said. “She passed and Shannon is fully helps me a lot, even though healthy (she had a standout she’s in college now.” Lauren, who now attends volleyball and basketball Dakota State, won the Class B season), the question now BY BEN HEGGE becomes, can she capture a 100-meter hurdles title from state title? — Especially with sports@yankton.net 2012-15. When that streak last year’s Class B champ began, Shannon was an One of the fastest sprinthaving graduated. eighth-grader. Injuries over ers in Class B is back for his “I have a lot to work the next two years, though, senior campaign and poised kept Shannon away from the on, for sure, but I know my track, but she bounced back potential and I know I can do for a breakout season. Taven McKee of Gayvillewell,” Shannon said. “We’ll late last spring to finish second in the 100-meter hurdles just have to see how the first Volin finished fourth place in the 100 and 6th in the 200 a couple meets go.” at the state meet. year ago at the 2017 Class B In Irene-Wakonda’s first Once again, there was a State Meet. After an offseason meet of the year, the Dan member of the Sokolowski of extensive workouts, McKee family on the awards podium Lennon Invite, Shannon was has aspirations to be even matched up with Menno for a hurdles event. better this season. senior Ashton Vaith, who finWhatever Lauren had “You can’t find someone ished fifth in the 100 hurdles who works harder,” said passed on to Shannon had at the state meet last year. paid dividends. Gayville-Volin head track and They finished 1-2 at the Dan “She saw a model; one of field coach Larry Buffington. Lennon meet, but Vaith took the best models you could “Taven puts in his time and watch,” Irene-Wakonda track first place. has really worked hard this “That should be somecoach Brent Mutchelknaus offseason, while playing basthing that will motivate Shan- ketball and football. It should said. non to work hard, and realize be a fun season.” “And I’m sure she gets some sisterly advice, whether there is some pretty good McKee and his fellow teamcompetition,” Mutchelknaus she wants it or not,” he mates spent the fall and winsaid. “Ashton is a competitive ter lifting and running before added, with a chuckle. athlete too, and will work just school, while going to football Sure, there have been as hard.” hurdles tips from sister to and basketball practice after. Added Shannon, “That sister, but most of the time, On top of that, McKee worked gave me some motivation to it was what Lauren didn’t out with longtime strength work harder, for sure.” say that caught Shannon’s and conditioning guru “Coach Viborg-Hurley junior Holly Rozy” three times a week. attention, the younger sister “It really was a grind,” said Richards finished sixth in the said. For example, Lauren McKee. “But, I know that’s tended to be more ‘locked in’ 100 hurdles at state a year what it takes if you want to ago, so that means three of ahead of her races, even to the point of not saying much the top Class B hurdles are in be great. You just have to put your time in.” the same conference (Cornto those around her — and While the 2017 season was belt). That should only help Shannon joked that she difpush all three throughout the a success for McKee, he hopes fers in that way. that all the extra work over spring. “In a way, she made me the last 10 months translates “It’ll be interesting to see more focused,” Shannon said. “Staying focused is one thing from week to week how they to faster times and more hardI’ll have to work on this year. compete against each other,” ware in 2018. “You can really see the “That’s what gave her that Mutchelknaus said. improvements,” said Buffingsuccess, and that’s what I Follow @jhoeck on Twitter ton. “That type of hard work need to do.” is contagious. Taven is a great For Shannon to reach that level, though, she’ll have to stay healthy. And that’s been a struggle throughout her high school career. Knee injuries kept her out of track for all of her freshman season and then most of her sophomore season a year ago. She wasn’t cleared to run to the hurdles until the final three weeks of the season, but still managed to qualify for state in the 100 hurdles in her first meet back. “Once I got that first meet Shannon Sokolowski Looks To Follow Family Flight Path Parker’s Karley Peters (630) was Class B track events MVP in 2017. The Pheasants move up to Class A this season. joked. That wasn’t exactly the case a year ago. Peters was battling knee problems last spring, even to the point where Bjorneberg said she tried a 400-meter dash earlier in the season and was screaming in pain afterword. “It was touch and go for a long time, but then she got healthy,” he said. Which meant Peters started to peak as she entered the state meet. “I couldn’t ask for a better ending last year, but it’ll be fun to see what I can do with a full season,” she said. And it’s not just the return of Peters that has the Pheasants excited for the 2018 track season. They also return all four runners from the 800-meter relay title quartet: Sophomores Mayson Preheim and Rayna Mohr, and eighth-grader Alexis Even will join Peters. Even also reached the podium in all three sprints last year at state, as well: She was sixth in the 400, seventh in the 100 and eighth in the 200. Even defeated Peters in the 60-meter dash at the Dan Lennon Invite to open this season, which proves that the Phesants are going to have a rather potent 1-2 punch. “Lexi and I have both gotten a lot faster, so that’ll be good for whatever relay we decide on,” Peters said. Parker also has high hopes for eighth-grader Ellie Travnicek, as well, according to Bjorneberg. And they’ll need that kind of depth if they’re going to compete in Class A this season. Although, with Peters, it may not matter the class, according to her coach. “I’m sure Class A was happy for a long time that Macy Heinz was in Class B,” joked Bjorneberg, in reference to the former Ipswich star who won 20 state titles. The competitor inside Peters will embrace the challenge of moving up a class, he added. “There will be some great challenges, but she has that attitude to want to push herself and prove herself,” Bjorneberg said. Of course, Parker would also point out that as a member of the Big East Conference, it has already been surrounded by Class A teams for many years, and the Pheasants see Class A competition throughout the season. It’s just that team-wise, it’ll be harder to reach the podium in Class A as compared to Class B. At last year’s state meet, Parker finished second with 48 points, while Madison and St. Thomas More tied with 64 points atop the Class A standings. “I think overall we should be good,” Peters said. “We’ll run against some different and some better competition at state.” It’ll be a new kind of challenge for her and the Pheasants, she added. “It’s definitely a challenge that will be fun,” Peters said. “It’ll be good; a new goal. 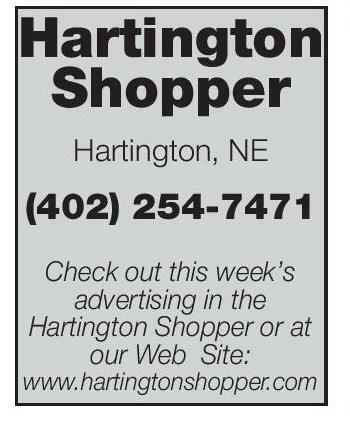 “We accomplished the ones last year, now it’s time for a new one.” Follow @jhoeck on Twitter Raiders’ McKee Motivated For Final Season Hartington Shopper Hartington, NE (402) 254-7471 Check out this week’s advertising in the Hartington Shopper or at our Web Site: Boys’ Golf 3/27	4/5	4/10	4/11	4/14	4/16	4/19	4/21	4/24	vs. Clearwater-Orchard/Santee Crofton Inv. 10 a.m. at Plainview/vs. ClearwaterOrchard	4 p.m. Ewing Inv. (Summerland GC)	9 a.m. Plainview Inv. 8:30 a.m. vs. Creighton/Ewing/ClearwaterOrchard	4 p.m. Lutheran High NE Inv. 9 a.m. Osmond Inv. 9:30 a.m. Niobrara Valley Conf. 9 a.m. 4/28	5/2	5/7	West Holt Inv. Niobrara-Verdigre Inv. Highway 20 Inv. (at Antelope CC) (at Bassett CC) Neligh-Oakdale Relays	3 p.m. Cedar Catholic Inv. 1 p.m. Knox County Relays	1:30 p.m. Neligh-Oakdale Inv. 12:30 p.m. O’Neill St. Mary’s Inv. 9 a.m. Boyd County Inv. 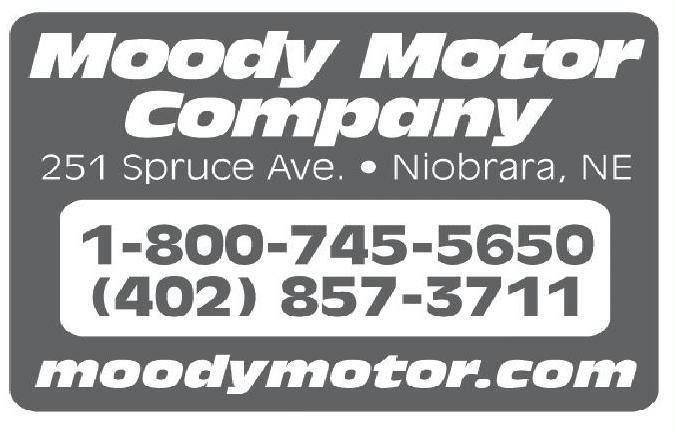 10:30 p.m. 4/26	4/28	Norfolk Classic	Niobrara Valley Conf. 4:30 p.m. 9:30 a.m. 5/1	Stuart Inv. (Atkinson)	9:30 a.m. Track & Field 4/5	4/12	4/14	4/19	4/21	4/24	4/28	5/2	5/3	5/7	(at O’Neill) (at Atkinson) 9 a.m. 9:30 a.m. 9 a.m. Boys’ Golf Track & Field 3/27	4/3	4/10	4/17	4/21	4/26	4/28	Cedar Catholic Inv. 1 p.m. Hartington-Newcastle Inv. 2 p.m. Cedar Catholic Inv. 1 p.m. Wildcat Inv. 1 p.m. Wausa Inv. (Pierce)	9:30 a.m. Norfolk Classic	4:30 p.m. Lewis & Clark Conf. 9:30 a.m. 5/3	Norfolk Catholic Inv. (at Laurel) 1:30 p.m. Follow @bigheadbenny13 on Twitter. 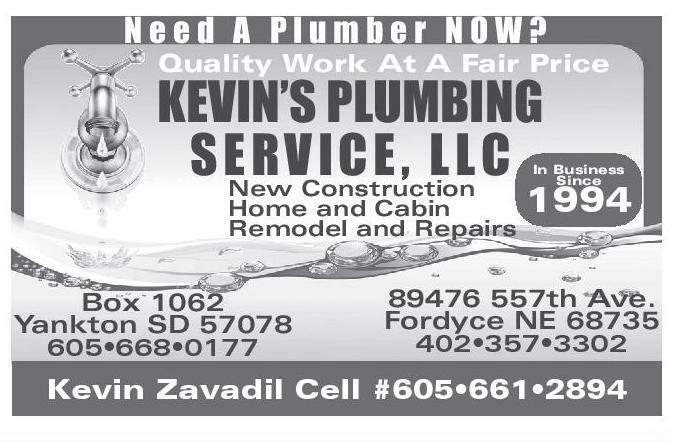 Quality Work At A Fair Price KEVIN’S PLUMBING SERVICE, LLC New Construction In Business Since Home and Cabin Remodel and Repairs 1994 89476 557th Ave. Fordyce NE 68735 402•357•3302 Box 1062 Yankton SD 57078 605•668•0177 Kevin Zavadil Cell #605•661•2894 Press & Dakotan photos are now available for purchase online! 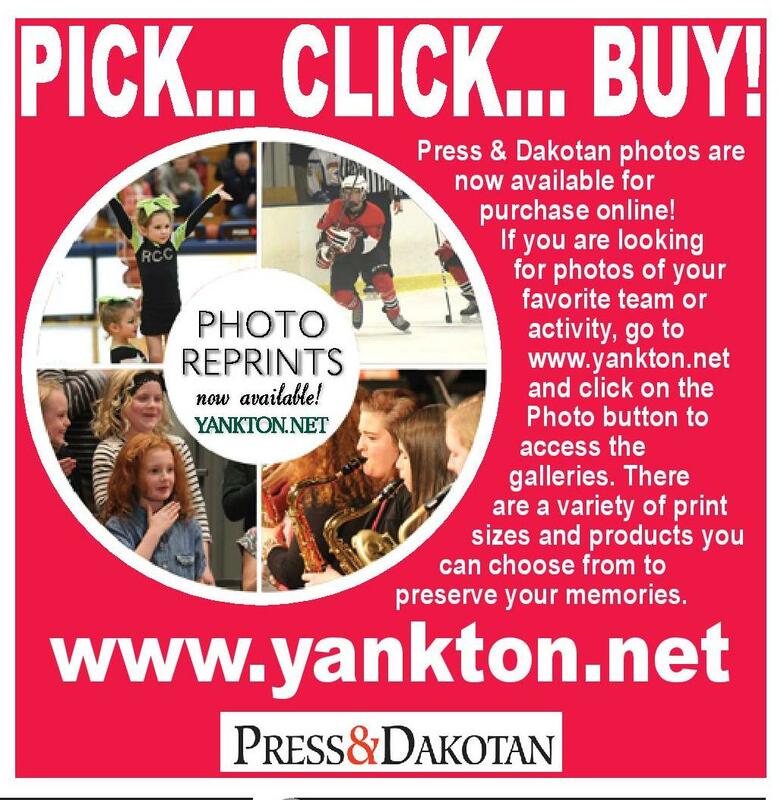 If you are looking for photos of your favorite team or activity, go to www.yankton.net and click on the Photo button to access the galleries. There are a variety of print sizes and products you can choose from to preserve your memories. www.yankton.net HARTINGTON-NEWCASTLE WILDCATS Crofton Inv. 10 a.m. Laurel-Concord-Col. Inv. 10 a.m. Plainview Inv. 8:30 a.m. Lutheran High NE Inv. 9 a.m. Mid-State Conf. (Hartington)	9 a.m. Hartington Inv. 9 a.m. Pierce Inv. 9 a.m. Niobrara-Verdigre Inv. 9:30 a.m. Wayne Inv. 9 a.m. Randolph Inv. 1 p.m. Gayville-Volin’s Taven McKee earned a pair of state meet medals in the sprints in 2017. Need A Plumber NOW? Track & Field 3/22	3/27	4/2	4/10	4/18	4/24	CROFTON WARRIORS Cedar Catholic Inv. 1 p.m. Knox County Relays	1:30 p.m. Cedar Catholic Inv. 1 p.m. SD-NE Challenge (Tyndall)	2 p.m. Pierce Inv. 2 p.m. Ponca Inv. 3 p.m. Norfolk Classic	4:30 p.m. Mid-State Conf. (Hartington)	10 a.m. Randolph Inv. 1:30 p.m. that same person for the younger kids, now. I never really get on them. If you just put in the hard work, they will too.” In their opening meet of the season, McKee finished fourth in the 60 meter dash (7.31) and sixth in the 400 (56.53) competing against athletes from South Dakota, Iowa, and Nebraska at the Class B Dan Lennon in Vermillion. While McKee has a decision to make on whether or not he wants to run track at the collegiate level, the opportunity is there with interest from local schools. “I have a decision to make, and it is going to be a tough one,” said McKee. 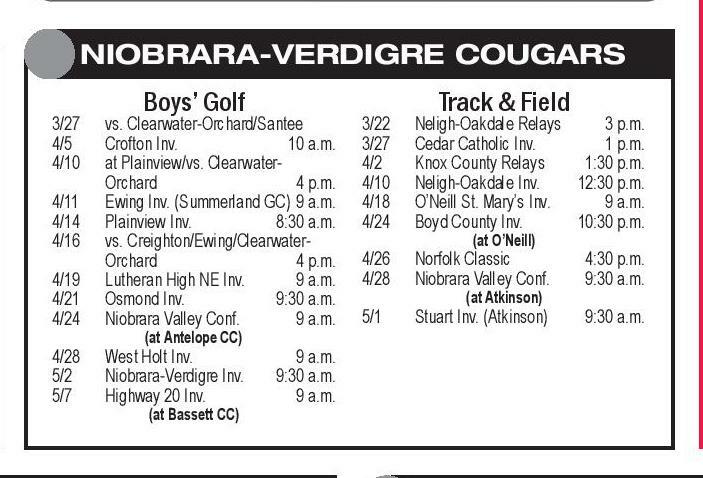 “But, for now the focus is on this season, and competing every meet.” NIOBRARA-VERDIGRE COUGARS www.hartingtonshopper.com 3/27	4/2	4/10	4/17	4/19	4/24	4/26	4/28	5/3	senior leader for our program. 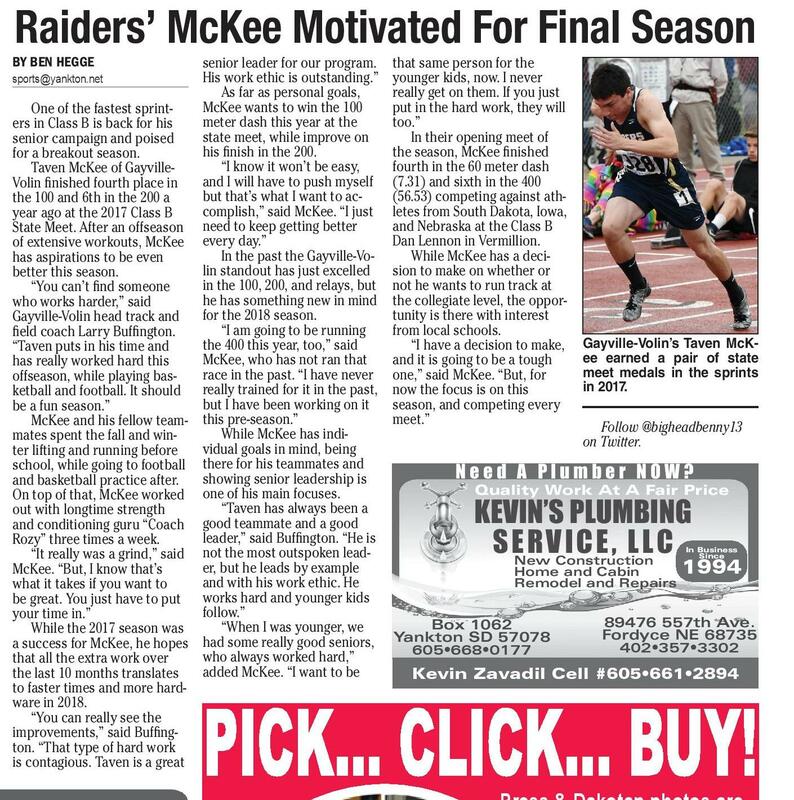 His work ethic is outstanding.” As far as personal goals, McKee wants to win the 100 meter dash this year at the state meet, while improve on his finish in the 200. “I know it won’t be easy, and I will have to push myself but that’s what I want to accomplish,” said McKee. “I just need to keep getting better every day.” In the past the Gayville-Volin standout has just excelled in the 100, 200, and relays, but he has something new in mind for the 2018 season. “I am going to be running the 400 this year, too,” said McKee, who has not ran that race in the past. “I have never really trained for it in the past, but I have been working on it this pre-season.” While McKee has individual goals in mind, being there for his teammates and showing senior leadership is one of his main focuses. “Taven has always been a good teammate and a good leader,” said Buffington. “He is not the most outspoken leader, but he leads by example and with his work ethic. He works hard and younger kids follow.” “When I was younger, we had some really good seniors, who always worked hard,” added McKee. “I want to be Boys’ Golf 4/2	West Point-Beemer Inv. 9 a.m. 4/10	at Ponca/vs. Hartington Cedar Catholic 4/12	Laurel-Concord-Col. Inv. 10 a.m. 4/19	O’Neill Inv. 9 a.m. 4/21	Osmond Inv. 9:30 a.m. 4/24	Hartington Inv. 9 a.m. 4/26	at Ponca/vs. Laurel-CC	TBD 4/30	Lewis & Clark Conf. (Wakefield) 5/7	Randolph Inv. 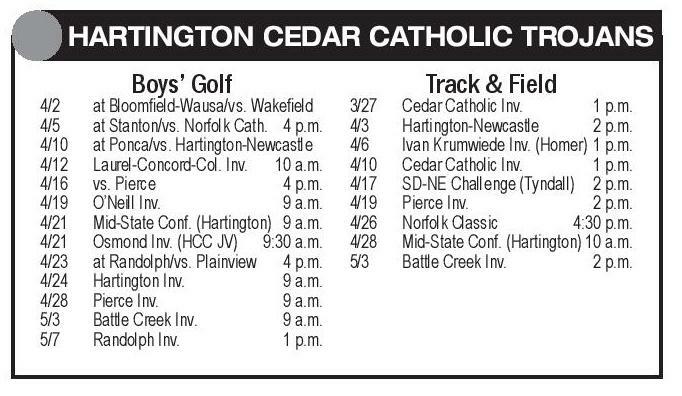 1 p.m. SUPPORT YOUR LOCAL TEAM BY BUYING ADS IN OUR SEASON PREVIEWS — CALL 605-665-7811 TO GET IN NEXT YEAR’S EDITIONS HARTINGTON CEDAR CATHOLIC TROJANS 4/2	4/5	4/10	4/12	4/16	4/19	4/21	4/21	4/23	4/24	4/28	5/3	5/7	Boys’ Golf at Bloomfield-Wausa/vs. Wakefield at Stanton/vs. Norfolk Cath. 4 p.m. at Ponca/vs. Hartington-Newcastle Laurel-Concord-Col. Inv. 10 a.m. vs. Pierce	4 p.m. O’Neill Inv. 9 a.m. Mid-State Conf. (Hartington)	9 a.m. Osmond Inv. (HCC JV)	9:30 a.m. at Randolph/vs. Plainview	4 p.m. Hartington Inv. 9 a.m. Pierce Inv. 9 a.m. Battle Creek Inv. 9 a.m. Randolph Inv. 1 p.m. 3/27	4/3	4/6	4/10	4/17	4/19	4/26	4/28	5/3	Track & Field Cedar Catholic Inv. 1 p.m. Hartington-Newcastle	2 p.m. Ivan Krumwiede Inv. (Homer)	1 p.m. Cedar Catholic Inv. 1 p.m. SD-NE Challenge (Tyndall)	2 p.m. Pierce Inv. 2 p.m. Norfolk Classic	4:30 p.m. Mid-State Conf. (Hartington)	10 a.m. Battle Creek Inv. 2 p.m.